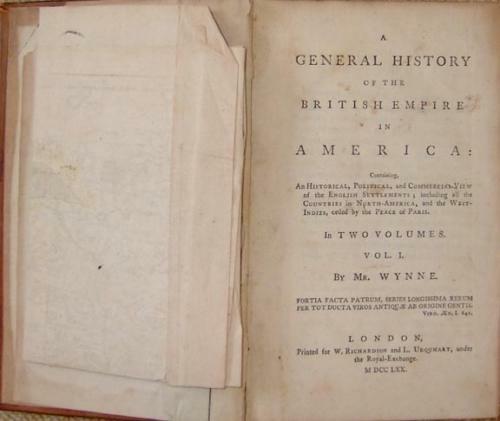 Title: 'A general history of the British empire in America : containing, an historical, political, and commercial view of the English settlements, including all the countries in North-America, and the West-Indies, ceded by the peace of Paris / by Mr. Wynne. London : printed for W. Richardson and L. Urquhart, under the Royal-Exchange, 1770.. 2 v. : folded map ; 22 cm. The second issue of the first edition. A general history of the British empire in America : containing an historical, political, and commercial view of the English settlements ; including all the countries in North-America, and the West-Indies, ceded by the peace of Paris. Map of North America by Bowen. 2 vols, 520+546 pages 8vo. In fair condition, loose front cover to the first volume and sone minor tears, creases and spots to the map.